Thread: Mapex Venus finally restored!!! Also to the drummer who posted that awesome picture of his malex v kit... i like how you had it set up.. some kits came with the 12in, 13in, 16in ft, 22x16 bass and a 14xwho knows what snare... lol. 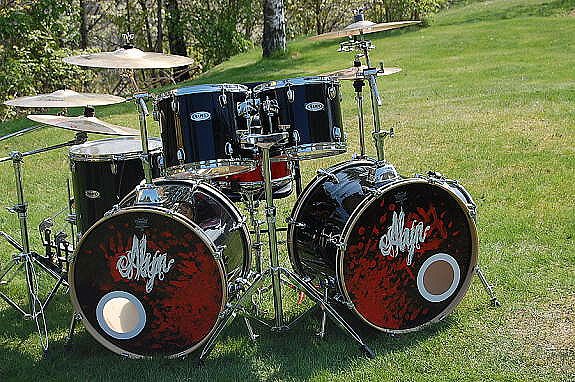 Then there was kits made with 8in, 10in, and 14in ft.. not sure if the bass drum was different. Odd though that i bought the 5 piece off craigslist, 2 days later i see an 8in and 10in tom with the exact same wrap as mine.. turned out it was the same seller.. got em both for 40$. It came with a snare but i bought a new one.. it came with a snare stand but i got a new one. Im keeping the ludwig hi-hat stand since it swivels for my bass pedals. Plus its solid, the hi-hats and 16in crash left much to be desired so I got the Meinl Super Pack. Got a decent deal for $255 from amazon. Just beware buying from their warehouse.. the items are used and may not come complete. If i missed your question I'll re-read through but please dont hesitate to message me. Mapex cant send me new badges so ill probably make my own. Check on eBay for badges. I found a set that might work for you but there are other options. I did an exhaustive search for Pearl Rocket Tom “Aluminum Shell” badges... no shot. Bro i feel your pain... the Mapex V is like considered the "lowest of the low" as I was informed by another fourm. But the deep tones and attatck i get from this 9 ply basswood is more than what i currently need. This was really just fun to see if I could take a very old set and make it look nice again without spending 350$ for just restoring the drums. It doesnt get cheaper than 20$ amazon wrap, aluminum foil, and a 2 liter bottle of coke. I knew getting cymbals and cymbal stands were going to be a pain. Plus that was going to be the bulk of the price. But i can use these cymbals and stands on any kit. My thing is my bass drum had a 1in diameter hole with 4 screw holes.. to be able to solidly fill that hole... sand it flush... then wrap it as if it was never there. Thats my satisfaction, yeah i used the same hardware but i also put rubber gaskets where all toms mounts are and i put a gasket behind each bass drum leg. Some get confused when i say i patched dents and dings.. I tried my tail off and the majority of the bad ones are gone. The drums have been tuned (used a drum dial to get a good baseline) then tuned the rest by ear. I tightened my reso head between 80 and 85 and my batters from 90 to 92. Then that gave me a great starting point. I have 4 rack toms... 2x of my rack toms are exactly the same length. My 8x8 and 8x10... my snare side is at an 80 and the reso side is 95 (im currently using all the rubber material as dampening pads.) Cutting them curved and sitting them on the bottom of my snare. I have an EMAD2 batter and a black remo reso, im also using the evans pillow on my reso.. i had to tune my 16x16 floor tom up because sometimes it was hard to tell the difference between the two lol. I do wish i had better rubber bottoms on my tom legs. I thought about a rack (because of the toms) but again this was sort of a budget build. The snare i got for under 100$, it was really the tom holders that cost so much.. oh and the 6 cymbals. I never owned this many... usually just hi-hat, 17in crash, 8in med crash, and 22 in ride. But those were Sabian AAX and my ride was an HHX. Yes I missed the other threads I don't go on the PDF much anymore.